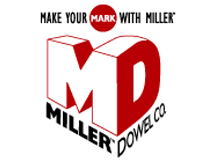 Miller Dowel Company is the developer of a revolutionary new method of solid wood joinery. MDC was founded in 2001 in Winnetka, Illinois, and in 2002 they launched their patented new products, the Miller Dowel and the Miller TruFit Step Drill. We pride ourselves on the fact that we have introduced a simple, quick, and inexpensive new method of wood joinery. This is the result of a basic, unique relationship between our engineered dowel and a correspondingly sized stepped drill bit. This new joinery method combines the advantages of natural methods of joinery with the speed and convenience of metal fasteners. Thus, in many cases where a screw, nail, wood dowel, biscuit, mortise and tenon, or dovetail is used, there is an opportunity for using Miller Dowel Joinery. End uses include furniture, framing, cabinetry, flooring, shelving, and much more. Natural methods of joinery are generally accepted as a structurally superior way to join wood components. They do, however, require more time to complete. It is a common misconception that nails and screws create strong joints. The truth is that metal fasteners are used because of ease, speed, and convenience. It is for these benefits only that nails or screws are infused into the design of a finished piece. Miller Dowel Joinery brings together the best of both worlds. Because a Miller Dowel is made from solid hardwood, it is inherently flexible, durable, and non-corrosive. Because it enters from the outside of a joint, it offers the same advantages as external fasteners. If you are dedicated to using natural joinery, the Miller Dowel Joinery will provide an opportunity to save time. If you are dedicated to working with screwed joints, Miller Dowel Joinery will offer an opportunity to build a higher quality piece in the same amount of time.